The property is a former dilapidated 3 Star Hotel which had been vacant for over 10 years. Galliard Construction took possession of the building in 2006/7 whereby it then underwent an 18 month dedicated renovation and conversion in to a be-spoke luxury 5 Star Hotel, tucked away in one of London's premier locations. 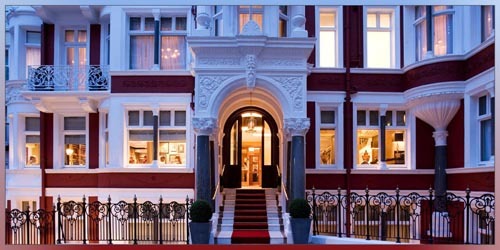 The Hotel was originally built in 1892 as gentlemen's chambers for the Aristocracy. Following its refurbishment, this glamorous Hotel now offers an unrivalled standard of accommodation. It has 60 elegant bedrooms, all of which have been Air Conditioned by Air Cool Engineering Systems Ltd to provide independent heating and cooling throughout together with dedicated Fresh Air make-up and Extract. The engineering required to meet the Consulting Engineers specific design criteria was extremely challenging and also had to accommodate numerous physical constraints presented by a 100 year old building. Air Cool Engineering Systems Ltd provided a fully tailored, co-ordinated and design developed Air Conditioning System utilising multiple 'Daikin' VRV Air Conditioning equipment to meet the required standard of the development. The AC fan coil units were all concealed ceiling void mounted with ducted air supplies to tailored wall grille / bulkhead arrangements. All the AC supply ductwork was also provided with an internal acoustic lining to reduce the potential for any mechanical noise transmissions. The VRV main condensing equipment was positioned to a Roof Top plant location area, which would then be further encapsulated within an acoustic enclosure to reduce any potential environmental noise transmission or escape to neighbouring properties. Daikin Centralised Controls were also incorporated within the overall VRV system design, enabling various facilities – typically: Power Monitoring, Group Control, Fire Shutdown and the like. The project was completed within the required programmed 12 month duration for the Mechanical Services installation. The value of the works was £551,000.00.